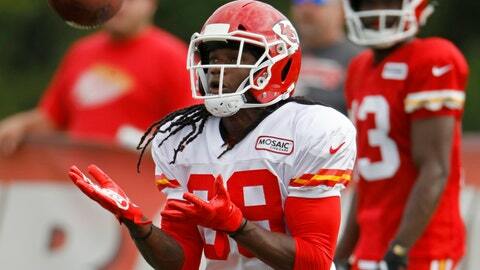 The Chiefs are working Tremon Smith as a kickoff returner and cornerback. ST. JOSEPH, Mo. — The fastest member of the Kansas City Chiefs was drafted in the fifth round a couple of years ago. Both were taken from small schools, though their routes there were very different. Smith was an overlooked-if-undervalued quarterback coming out of high school who landed at Central Arkansas because bigger schools were unwilling to give him a chance. Hill began his career at Oklahoma State before a domestic violence incident landed him at West Alabama. That shouldn’t necessarily come as a surprise. Smith picked off 15 passes over four years at Central Arkansas, even though teams rarely threw in his direction. He also held his own against Power Five schools, picking off a pass against Oklahoma State in 2015 and leading Central Arkansas in tackles against Kansas State — his team’s only loss before the FCS playoffs last season. Smith acknowledged the adjustment from a small school was tough. He was star-struck walking into the locker room and seeing safety Eric Berry for the first time, and the size of the playbook and the nuances that come with an NFL defense represented a whole new world.